The Battery Technologies Conference offered insight in to compliance and standards issues relating to batteries, research and development (R&D) in the battery industry, and the roadmap for assessing if energy storage could be a future industry locally and internationally. Power-to-power – a process of converting electrical energy from a power network into a form that can be stored for converting back to electrical energy when needed with minimal energy losses due to inefficiencies; secondly, power-to-heat is a process where electricity is used to generate heat for consumption at a later time, and lastly, power-to-gas is a process where electricity is used to produce a gas such as hydrogen. The hydrogen can then be used as a fuel or to produce electricity at a later stage. Energy storage holds huge potential for economic development in South Africa with opportunities in mining and beneficiation, R&D, commercial exploitation, local industry development, and global market player aspirations. It is important for role players to align and cooperate to develop the energy storage industry in a structured and co-ordinated approach between government and industry, he said. In line with co-ordinated approaches highlighted in Strydom’s presentation, Dr. Mkhulu Mathe, manager of Energy Materials at the Council for Scientific and Industrial Research, highlighted the current battery research and development activities taking place at the uYilo e-Mobility Technology Innovation Programme. uYilo and the Nelson Mandela Metropolitan University are testing full sized vehicle starter batteries and are undergoing SABS validation testing within a SANAS 17025 accredited laboratory. The facility is expanding to include validation testing of advanced batteries (Li-ion) and their use in eMobility, renewable energy and stand-by power at the cell level. The R&D projects include understanding and characterisation of battery electro-active materials at the chemistry and materials level; and integration and optimising of cells into 12 V battery systems in various applications. 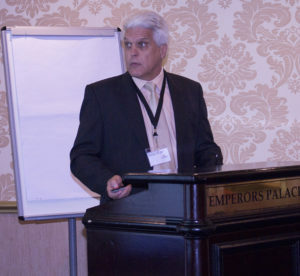 Other presentations, some of which were of a more technical nature, included an assessment of how the design and innovations in battery technology have evolved, by Antony English of Freedom Won, a presentation on sealed lead acid battery monitoring and common modes of failure by Dean Marcus of AZ Tec Electronics, an investigation into the operational problems in batteries, by James Verster of Blue Nova, and the progress made in the manufacturing of Li-ion battery cells, by Professor Vladimir Linkov of the University of Western Cape. The post Battery storage holds economic potential appeared first on EE Publishers.